Labour has urged the Conservatives to carry out a gender audit of its tax and spending policies, as the shadow equalities minister, Sarah Champion, published analysis showing that 86% of the burden of austerity since 2010 has fallen on women. Champion said research carried out by the House of Commons library revealed that women were paying a “disproportionate” price for balancing the government’s books. The analysis is based on tax and benefit changes since 2010, with the losses apportioned to whichever individual within a household receives the payments. 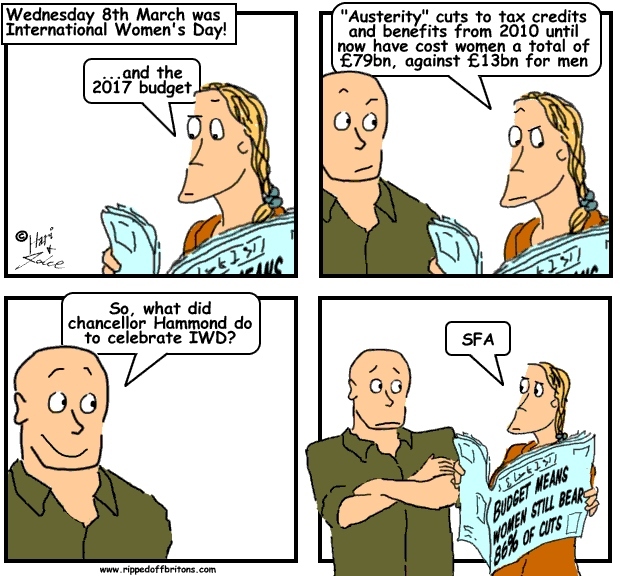 In total, the analysis estimates that the cuts will have cost women a total of £79bn since 2010, against £13bn for men. It shows that, by 2020, men will have borne just 14% of the total burden of welfare cuts, compared with 86% for women. Many of the cuts announced in earlier years by former chancellor George Osborne, including a four-year freeze on many in-work benefits and reductions in the universal credit, are yet to bite. Hammond has loosened Osborne’s fiscal rules, but he will press ahead with most of the pre-planned austerity measures – though the tax credits rebellion forced the government to promise not to look for fresh savings from the welfare bill in future years. Mary-Ann Stephenson, co-director of the Women’s Budget Group lobby group, condemned the Tories in light of the new research. She said: “The chancellor’s decision to continue with the decisions of his predecessor to cut social security for these low income families, at the same time as cutting taxes, is effectively a transfer from the purses of poorer women into the wallets of richer men.” The government publishes an analysis of the differential impact of its policies at different points on the income scale, but does not carry out a gender analysis.